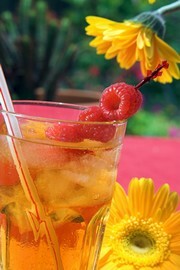 Four delicious iced tea recipes to get you through a hot summer day. When the temperature starts to rise, a cup of hot tea can quickly lose its appeal. 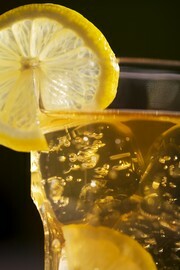 When the dog days of summer hit, it is time to switch that tea mug for a tall, frosty glass of iced tea! 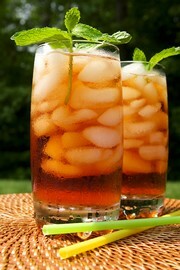 To help you beat the heat, here are some iced tea recipes that are both refreshing and delicious. Step 1. Bring 5 cups of water to boil on high heat. Add the tea bags, peaches and mint leaves. Step 2. 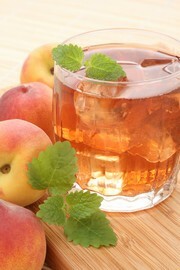 Turn the heat down to low and simmer for 5 minutes, until peaches are soft. Press the peaches against the side of the pot using a slotted spoon. Step 3. Strain the mixture from the pot into a ½ gallon-sized heatproof pitcher, filtering it through a layer of cheesecloth to strain out the peach pulp. Step 4. Add sugar and stir to dissolve. Fill the rest of the pitcher up with cold water and chill in the refrigerator. Step 5. Serve over ice. Sun Tea uses the heat of the sun to brew tea, so it’s strong without being bitter. Be patient - it takes a whole day to brew, so if you are looking for instant gratification you might try another recipe in the meantime. Step 1. Put all ingredients in a 1 gallon glass pitcher and stir vigorously. Step 2. Put a lid on the pitcher and set it out in the sun. Make sure it’s somewhere where it will get a full day of sunlight. Step 3. Wait 8 hours. Step 4. Remove the tea bags and place the pitcher in the fridge. Step 1. Bring 5 cups of water to a boil in a large pot on the stove. Step 2. Add the green tea bags and turn the heat down to low. Step 3. Simmer for 5 minutes, and then remove the tea bags. Step 4. Pour the tea into a 1 gallon heat-proof pitcher. Add the pomegranate juice, rosewater, honey and the remaining 5 cups of water. Step 5. Put the pitcher in the fridge to chill. Step 6. Serve over ice. Step 1. Bring 5 cups of water to a boil on the stove, and then add the tea bags, cinnamon and cloves. Step 2. Turn heat down to low, and allow it to simmer for 5 minutes. Step 3. Turn heat off and remove tea bags and spices. Step 4. Pour hot tea into a 1 gallon heatproof pitcher. Step 5. Add apple juice and remaining 3 cups of cold water. Step 6. Put the tea in the fridge to chill. Step 7. Serve over ice in tall glasses dusted with cinnamon and sugar.